It had been an ambition of our managing director’s for many years to try and raise funds to sponsor a guide dog puppy. A couple of years ago we were in the position to start raising the funds, and with a whole office of animal lovers, everyone got on board! Guide Dogs are a national charity who work endlessly to improve the lives of those who are blind or partially sighted. They provide independence and mobility to people who would otherwise perhaps not have the confidence to go out alone. 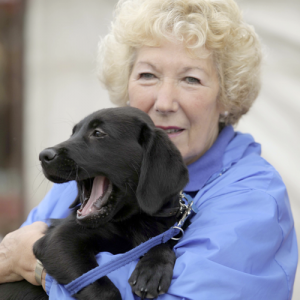 The charity has successfully been breeding and training guide dogs for over 75 years whilst continuing to educate people about visual impairment and campaigning for their rights. And so it began. Just Digital staff rallied together to try and reach the £5,000 target to be able to sponsor a guide dog puppy. The ‘Puppy Pound Appeal’ was born and a number of fundraising activities were organised in the office including CD donations, cake sales and dress down days. One member of staff even ran the London marathon in support! In early 2013 our £5,000 target was reached, thanks to generous donations from staff and clients, and the company topped up the rest by putting in £50 for every one of our clients that spent over £5k with us throughout the year. Just Digital were now able to fund a puppy through their first year of training to become a guide dog! When it came to naming the puppy, staff were asked for suggestions and it didn’t take long before the name ‘Jaydee’ was decided. Now all we needed to do was wait for him to be born! 22nd June 2013: Jaydee is born. Pictured here at just a few weeks old, he’s a black Labrador cross Golden Retriever with big bright brown eyes. An adorable bundle of fluff, Jaydee will soon be placed with a Puppy Walker in the local area who will help him through his first year. September 2013: Jaydee is placed with Lynne, a lovely Puppy Walker volunteer who is based in the Huntingdon area. He is growing fast and has already begun to learn basic commands such as ‘sit’ and ‘paw’. He will live with Lynne for the next year while he does his basic training. 25th November 2013: The day we finally get to meet our gorgeous puppy! All of the JD staff are extremely excited to meet him and can’t wait to find out how all their fundraising is already making a difference. His Puppy Walker showed us exactly why Jaydee is such a special puppy by demonstrating all of the commands he had learned at just 14 weeks old. He was immaculately behaved and put most of our pets to shame, as he can already sit, lie down, come and stay. Jaydee receives lots of fuss and cuddles from the JD staff. Lynne explains that this is a great opportunity for Jaydee as it is important for guide dog puppies to experience lots of different surroundings ready for when they are placed with their new owners. Throughout his first year, Jaydee was exposed to lots of different experiences including, Crufts and the launch of the first ambulances in our region to be adapted to improve the journey of patients with guide dogs to hospitals. Jaydee and Lynne are regularly spotted out and about in the local area encouraging other people to sponsor a guide dog. We are told that Jaydee has inspired two other local community groups to sponsor a puppy of their own! Jaydee made such an impression on us that we just had to try to raise the funds to sponsor him through his second year of training. He made one last visit to us before he was off to school in London where he spent the next few months at a training centre learning about special awareness, traffic and much more. October 2014: Jaydee is now heading off to advanced training in London where he will learn to conquer the tube as well as large groups of people, escalators and more! We are told that Jaydee may have a potential match for a new owner so will be off to meet him or her soon. January 15: Jaydee has been matched with a lovely lady from London called Kara. Kara tells us that she fell in love with Jaydee the first time she met him, so will now be spending lots of time bonding with him ready for when he can live with her full time. February 15: Jaydee is now fully qualified! It makes it all very worthwhile to know that we have helped a blind person to be able to live an independent life, confident in the fact that their guide dog will keep them safe. 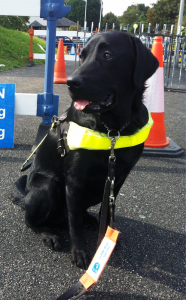 Jaydee will be Kara’s 5th guide dog and will enable her to travel to work in London.